This is a truly unique 1920's vintage property that has been completely renovated for your pleasure and comfort. If interested in an urban vacation experience, in Tucson on business, maybe a yoga workshop or a training athlete, this is the place. Complete kitchen with granite counter tops and slate back splashes, lots of cooking utensils, and fully equipped . Comfortable and cozy in every way with flat screen television , Roku internet steaming, Pandora radio, Netflix, and much more. Enclosed interior courtyard with outdoor seating for meals and relaxation. More than a wonderful alternative to a hotel stay, you'll be pleasantly surprised with the accommodations. There are 2 sides, an East/West apartment, with a shared courtyard. They are not identical, but offer the same amenities - each side has it's own distinct personality. A bit about the 'hood. Close proximity to Downtown, 4th Ave. shopping , U of A - all within walking distance, great urban location! I have always loved and lived in older homes. The construction is solid, unique, with great detailing that you don't normally find in newer buildings. I love the challenge of renovating places with good bones, preserving the old, and adding something new. This is a great neighborhood, West University, one of the oldest in Tucson! The proximity to everything Tucson is a major plus. You can walk to most venues, and the rest are a short drive to get there. Easy access to I-10, walkability score of West University neighborhood is very high. This property is in close proximity to Tucson's vibrant city center. You will be within walking distance of a great deal of many events on any day-lots of museums, shops,restaurants,etc. to explore. flat screen television with Roku internet streaming, Netflix, Amazon Prime, Pandora Radio etc. Luxurious linens and natural toiletries provided, we also provide locally roasted coffee, exclusively for our guests and premium teas, plus grinder and press pot. Original refinished wood floors and exposed brick next to ceiling. European shower room with stone floor, radiant heat underneath. A great neighborhood for tooling around... Meticulous attention to detail. WOW! Very cosy and clean. Walking distance from restaurants and downtown. For the ones who appreciate high speed internet, this is the place for you. Debra,the owner is one very special person...very people friendly ...in fact she really loves her clientel..one can feel that upon meeting her. We enjoyed our stay very much. The owner was so nice and very helpful. I would highly recommend this suite to others. The location was excellent. We loved the studio space we stayed in. It's in an area we like to go to chill at night. Simple and has everything you need to make yummy meals for yourself. There's even enough space for 2 people to do yoga! I really enjoyed the cool floor tiles. Debra takes great care of her property and it shows. Debra kept the place very clean. She is readily available. House is small, but very comfortable. We stayed a month & enjoyed ourselves immensely. "HomeAway" is the perfect trademark because during the month my wife and I stayed here it quickly became like a home to us. 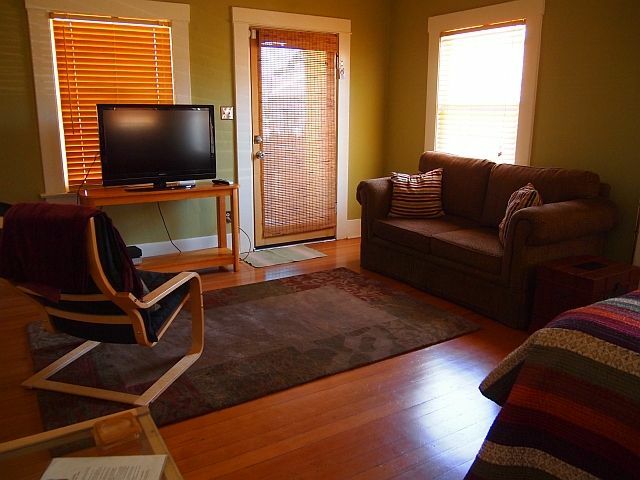 Located within easy walking distance from the University, 4th Avenue and downtown. Also close to bus and streetcar. We stayed for one month and although we did a lot of tourism in that time, we also spent a good bit of time just relaxing and enjoying our little house and garden. Our landlady was a pleasure to deal with, and we plan to stay here again the next time we come to Tucson. Although the space is compact, it is efficiently laid out. The kitchen is fully functional and we had a number of home-cooked meals. Boutique grocery stores as well as supermarkets are close by. The only downside is that there is a park a few blocks to the north which attracts homeless people, and you might see them from time to time passing through the area. But still a delightful neighborhood to stay in, and I never felt in danger walking alone or at night. Bird watchers will enjoy the garden visitors. The Tucson Audubon Society is a short walk away. The property is split into two units, so occasionally we had neighbors, both of whom were repeat customers. That's the kind of place this is. It's just been a couple of days and I already miss it. A great pedestrian neighborhood, great local bus service and now the streetcar construction is complete, up and running! In close proximity to the University of Arizona, 4th Ave. Shopping District, and Downtown Tucson, which offers many music and great dining venues, wonderful natural food coop within walking distance , nightlife, and entertainment, lots of excitement, lots of fun!